Kolkata is a sought-after travel destination for both leisure and business travelers. Thus, to ascertain a memorable stay to guests with different preferences, there are numerous resorts. Guests, looking for luxurious stay, there are deluxe golf resorts. These resorts are known for modern facilities and services and huge golfing area. These resorts win the heart of guests by providing luxurious stay and an opportunity to indulge in a sport which has association with erstwhile royals. The rooms are well-appointed and equipped with all modern amenities to make the stay memorable and pleasurable. 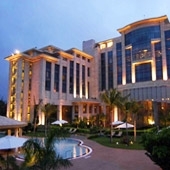 Hyatt Regency Kolkata is one of the luxurious golf resorts in India. The resort has 18-hole golf courses. Additionally, the resort is praised for plush rooms equipped with ultra modern facilities and exceptional services.